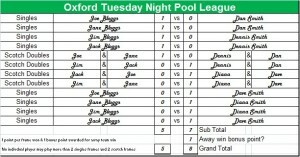 Oxford Bar Billiards Ltd Pool League is CHANGING!! We are moving from our traditional Monday night slot to a Tuesday night, in the hope that this will entice a greater number of players, and give our league a bit of a facelift! The format is being changed to allow pubs to enter with slightly fewer players. 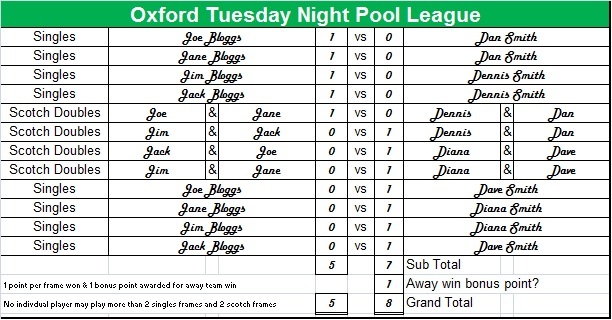 And scotch doubles is being introduced to make the evening a bit more sociable and to offer something different from the other Oxford pool leagues. With a 4 players, each player will play two singles frames and two scotch doubles frames in the course of the evening. If a team has more than 4 players, then reserves can be substituted in as desired, as long as no player plays more than 2 singles frames plus two scotch frames. Teams may choose to play each of their players once in each singles set (per Abingdon League) but this is not essential. Our format still allows some flexibility for late arrivals/early departures where necessary, because a player may play both their singles frames in set 1 and none in set 3 if they wish. This is also aided by the scotch frames being in the middle of the evening. Scotch Doubles is like normal doubles, except you and your partner take a shot each instead of a visit each. If Player A pots a ball on his go, their partner Player B comes to the table to play the next shot, if they pot Player A returns to the table, and so on… There will be no talking between partners once their visit has commenced. Points will be awarded for each frame won. A bonus point will be given for an away win. Teams will be divided into sections based upon ability, and there may be split sections if deemed necessary. During the season we will assess the merits of the new format, and will take on board any comments received, with a view to making any alterations necessary to further improve the league for the following season.